Now that I have sort of got the workshop into some sort of order I have been able to make a start on some of the many jobs that have been on the back burner. During this past week I have fitted the BEP 600 - DCSM which from now on I shall simply refer to as the Systems Monitor. At first glance it simply looks like a fancy ammeter and voltmeter but it does so much more than that. 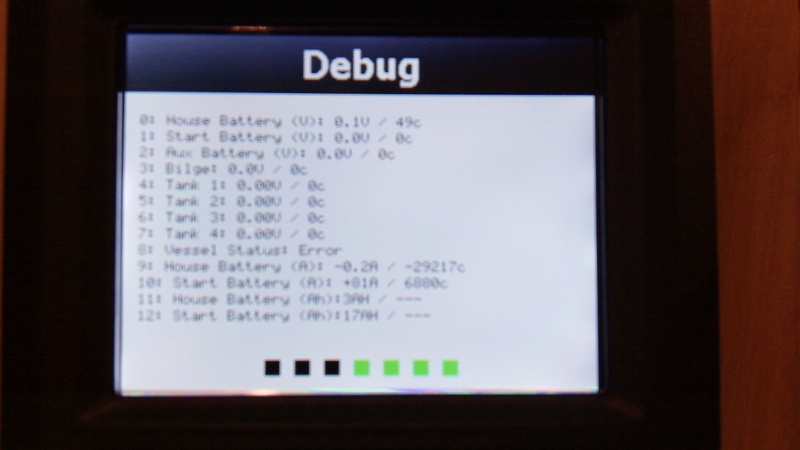 Depending on the way that the systems monitor is wired it can monitor a couple of battery banks, including voltage, amps and capacity remaining. It can also monitor tank levels when connected to a compatible sender unit, monitor any systems in operation and is also capable of watching over one or more bilge pumps. This last feature could be very useful to some as the monitor can be interrogated and will tell you at a glance how often the pump has cycled on and off. The unit also has a visual and audio alarm function, so say the house battery bank is getting critically low an alarm will sound alerting you to the fact that the batteries need to be charged up. Back in the day before electronic navigation electrical systems on boats were pretty basic, there may have been a few cabin and navigation lights all running from one battery and that was pretty much it. But now multiple battery banks are the norm along with a plethora of other electronics and electrical circuits. Underlying all this is an essential need to keep the batteries in tip top condition for without battery power the best electronics in the world add up to nothing. One of the best aspects of the monitor is just how clear and easy to read the display is. When I powered up the unit for the first time I have to say how impressed I was with the brightness and clarity of the almost 3 inch display panel. Offering both day and night modes it is fully dimmable from 0 to 100%. For the sake of the pictures the display is turned up to maximum brightness. I wear glasses for reading but even when I switched the unit to self diagnostic mode the small characters were easy to read. While on the subject of the display the legend at the top of each page can be custom set. Compare this picture with the one above now that I have added the name of this blog into the bar at the top. Connecting up the unit is pretty straightforward, the wires connect into a couple of terminal strips at the back of the unit. I ought to mention that the oblong black thing at the bottom of the this picture is a USB socket which is used to update and save user settings. So up to now this is all good. What is not so good is the manual which although contains all the user information that you could possibly need is lacking in one or two areas. Firstly I think that the front of the book should give a good overview of the unit, it's main features and capabilities. The Raymarine installation and instruction booklets I have always thought have done very well in this regard. Secondly there is no template for the cutout that needs to be made into the helm or dash mounting plate. Sure you can always take measurements from the unit itself but here again the likes of Raymarine do a good job in providing this for you. All that is needed is a paper template on one of the blank pages in the instruction book which could be cut out with a pair of scissors. This all may sound pretty basic, which it is, but taping a paper template in place before cutting out a hole allows one to sit back in the helm chair visualize that the monitor will be in the correct position and show where mounting holes have to be drilled. All in all though these are minor points, the system monitor is a great piece of kit which has the potential to replace a whole host of other stand alone gauges on board, it is easy to read and set up and the on screen functions and menus are intuitive easy to understand and easy to get to grips with after just a few minutes of first powering up the unit. I love it and highly recommend this unit. I have just been advised by BEP that these are not designed to be retrofitted into existing BEP panels. Ludicrous!! Why don't they put out a fascia that would make the job a ten second one?!?! You can swap the analogue meters without a drama. Looks like I'm up for a lot of work to get a nice finish. Installed one on my yacht, great gadget which will monitor every thing on board, get two and set one up as a mimic panel, so easy to use and calibrate. Hi Mark.... I hope you are still enjoying your BEP 600 after all this time. Did you ever need technical support? I am unable to find anything useful on the web... perhaps you can direct me? 1. Error message during diesel tank calibration. I managed to calibrate the port, starboard and forward water tanks. Then success calibrated the port diesel tank but got an error message halfway through the calibtation of the starboard tank ....it said something like "values out of range". Any ideas? 2. Amp Hrs decreasing with batteries fully charged. After many miles of motoring and sailing and "logical" battery levels and discharge info from the monitor, things suddenly changed. The Discharge rate remained around 25AH and the capacity continued to decrease (from the maximum of 830AH) to below 130AH, even through we were frantically running both the Yanmar diesel AND the Onan generator. I tried a monitor shutdown (pulled the fuse to restart the screen, but still no change. We powered off he Yanmar and restarted it, still no change. After arriving in port (in Vauatu) powering down the Vanmar and Onan, and 20 minutes of trying to connect shore power, the monitor jumped from 131 AH to 830AH before I connected the shore power. All the time the batteries were showing the normal phases including absorption so I think the batteries are ok.
Any help or direction would really be appreciated .... Unfortunately technical skill is a bit thin here in Vanuatu, Solomons and New Guinea! Thanks for the comment and your exasperating problems that you're are having with your monitor. I have had few problems mine. After giving your problem some head scratching I think that I have an answer for you. I played around with my monitor and I too was able to replicate a similar problem to yours. It seems that if the connections to the shunts are not of the best then you will get weird readings. Make sure that the twisted pairs that go to the shunts are in really good condition, the connections need to be perfect. Also, these twisted pairs are very susceptible to interference – are they near the battery charger, an alternator or other source of magnetic interference. I'm sure that your batteries are being charged OK and the problem is in these monitor wires that run from the shunts to the gauge and that's where I would focus my attention. Thought I would mention that there is an updated firmware available for this device. It's available at http://www.bepmarine.com/en/80-600-0021-00 and is dated 20140724. I'll download it and update the device. Hi, I had the same issue some time back. What worked for me was turning off all the power at the breaker then holding down the power key on the display while flipping the breaker back on. Keep holding the key on the unit until it resets.